The Brandenburg Gate (German: Brandenburger Tor) is a structure in Berlin, Germany. It is the only remaining gate through which people used to enter Berlin. It was built between 1788 and 1791. It is located between the Platz des 18. März and the Pariser Platz. Nearby to the north is the Reichstag building. During the Cold War, the Reichstag was in West Berlin, and the Brandenburger Tor in East Berlin. 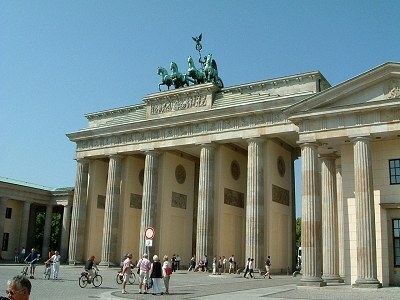 The Brandenburg Gate has twelve columns, six on the entrance side and six on the exit. The columns form five roadways, citizens originally were allowed to use only the outer two. This is rather like Admiralty Arch in London, the central roadway is reserved so that royal and important traffic is not delayed. On top of the gate is the Quadriga. 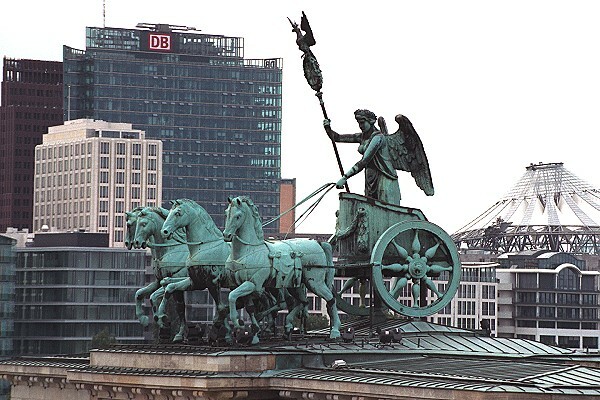 This is Viktoria, the goddess of victory driving a Quadriga, a type of horse-drawn chariot. After 1806, when Prussia was defeated at the Battle of Jena-Auerstedt, Napoleon stole the Quadriga and took it to Paris. When Napoleon was beaten in 1814 Prussian General Ernst von Pfuel occupied Pais and took the Quadriga back to Berlin, the olive wreath was changed to an Iron Cross. The Goddess Viktoria became Nike, goddess of victory. When the Nazis came to power, they used the Gate as their symbol. The Gate was damaged but not destroyed during World War II. The governments of East Berlin and West Berlin restored it but it was closed when the Berlin Wall was built in 1961. The gate was in the middle of the death strip. The German question will remain open as long as the Brandenburg Gate is closed. In 1987, U.S. President Ronald Reagan gave his famous speech "Tear down this wall!" outside of the gate. Von Weizsäcker was the President of Germany at the reunification. The Gate then symbolized the freedom to unite the City of Berlin. On the 22nd of December 1989, the Brandenburg Gate re-opened when Helmut Kohl, the West German Chancellor, walked through to be greeted by Hans Modrow, the East German Prime Minister. 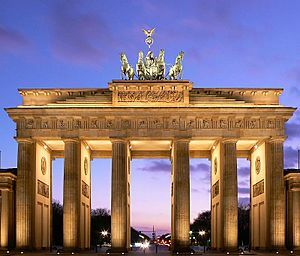 On December 21, 2000, the Brandenburg Gate was privately refurbished at a cost of US$3 million. The Brandenburg Gate in 1982 seen from the East Berlin side. Behind the gate is the Berlin Wall. In front is the rail that was accessible from East Berlin. Ronald Reagan speaks at the Berlin Wall's Brandenburg Gate on June 12, 1987, challenging Gorbachev to "tear down this wall!!" In 1984, East Berliners and others were kept away from the Gate, which they could view only from this distance. Brandenburg Gate Facts for Kids. Kiddle Encyclopedia.